Mengchi Wang1†, David Wang2†, Kai Zhang1, Vu Ngo1, Shicai Fan2,4, Wei Wang1,2,3*. 1. Bioinformatics and Systems Biology Graduate Program, 2. Department of Chemistry and Biochemistry, 3. Department of Cellular and Molecular Medicine, University of California at San Diego, La Jolla, California, USA. 4. School of Automation Engineering, University of Electronic Science and Technology of China, Chengdu, China. †M. Wang and D. Wang contributed equally to this work. Wang, Mengchi, David Wang, Kai Zhang, Vu Ngo, Shicai Fan, and Wei Wang. 2019. 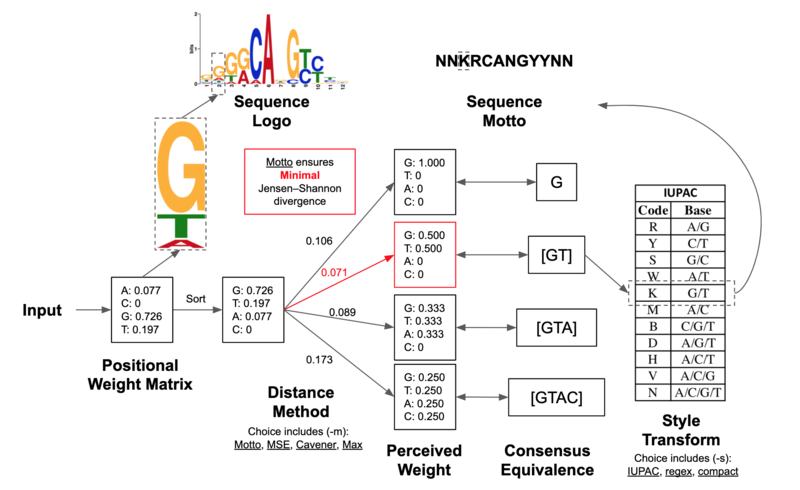 “Motto: Representing Motifs in Consensus Sequences with Minimum Information Loss.” BioRxiv, 607408. https://doi.org/10.1101/607408.